Frequently Asked Questions from consumers that we have answered. Use the belt. Without the belt, your baby may be able to escape from and fall out of the Bumbo Floor Seat suddenly. If the belt is damaged, stop using the Bumbo Seat. Stay with and watch your baby during use. Do not use the Bumbo Floor Seat for prolonged periods. Do not attach strings or cords to the product – they can cause entanglement or strangulation. Store the Bumbo Floor Seat out of reach of children. When not in use, belts can cause entanglement or strangulation. Your belted baby may be able to cause the Bumbo Floor Seat to move. Do not use on raised surfaces such as tables, counters, chairs, beds, or near stairs to prevent risk of serious injury from falls. Place flat on floor or ground on a firm, level surface and keep away from walls or other objects your child could push against to avoid tip over. Consider the surroundings. Keep away from strings or cords (such as those on window coverings) that can cause strangulation. Look out for heavy objects your baby could pull over. Use appropriately: the Bumbo Floor Seat is not a replacement for other baby products. Do not use as a booster seat or in place of a high chair. The Bumbo Floor Seat should never be used on raised surfaces. Do not use as a bath seat or in a kiddie pool. Using the Bumbo Floor Seat in or near water can lead to drowning. 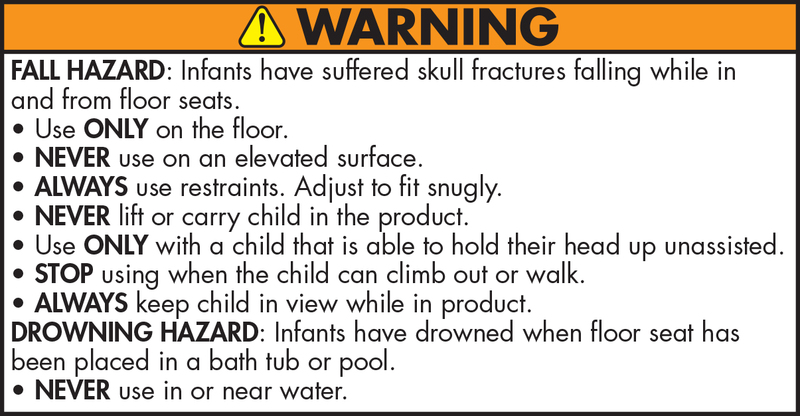 Do not use in place of a crib or play yard. Your baby may be able to move the Bumbo Seat. Do not use as a child carrier. Lifting, tilting, or carrying the Bumbo Floor Seat while your baby is in it can result in a fall injury. Do not use as a car seat.